The B2B marketing space is buzzing about Account-Based Marketing (ABM). The concept isn’t new. B2B selling has long been an account-based activity, and most B2B marketers have been practicing some level of ABM in supporting their sales teams. The current interest in ABM is simply the next maturation of marketing automation practices and technology. But, ABM is impossible without quality data. ABM is a way to scale down while improving the precision of your target outreach, which means you must ensure the quality of the data that enables these activities and analysis. 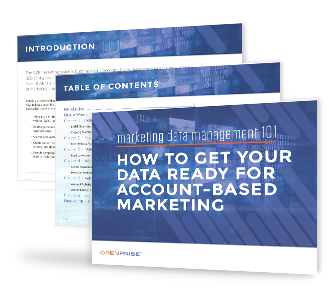 Read this guide now to build a solid foundation for your ABM initiative.